After two excellent predecessors, loyal Friday the 13th fans were raving for another romp in the woods with Jason when this movie came out in 1983 (and it was even going to be in 3D!). I know that I for one was plotting and scheming to find a way into a theater to see it. After several thwarted attempts, I eventually did. The question is, was it all we thought it would be? Was I disappointed? No, I wasn't, but I was 11 and had even lower viewing standards than I do now and they still aren't that high. Even with the excitement of seeing a new Friday the 13th movie, I felt, even then, that something was just not the same. Don't get me wrong, I thought it was a great movie at the time, but it just didn't have the same punch as the first 2. I couldn't put my finger on it at the time and, to be honest, I'm still not entirely sure what it is. 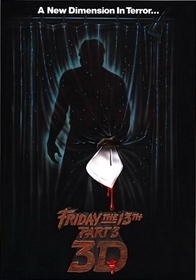 After I recently took another look it though, I think that I can spot a few of the flaws, as well as a few of the bright spots that make Friday the 13th, Part 3 the movie that it is. The story begins the day after the events of Part 2. Jason has survived the knife wound that was inflicted on him by that film's survivor. After killing a husband and wife who run a rural roadside market, and stealing some clothes from their hanging laundry, he limps back into the woods to await a fresh batch of victims. The wait isn't a long one. A group of teens is off on a weekend of fun at a rustic farm that isn't, we assume, far from Crystal Lake. After a short stay at the farm, two the teens go into town for supplies and run afoul of a local motorcycle gang. The gang follows that couple back to the farm and soon both groups become Jason Fodder. Aside from the fact that one of the girls has been attacked by Jason before and has returned to face her fears, there isn't much else to the story of Part 3. Although he can still be hurt and still seems pretty human, Jason is on his way to becoming the horror icon that he will later become. He finally gets his trademark hockey mask, which he takes from one of his victims and he looks radically different than the way he looked in the previous movie. I know that every director has their own vision of how a character should look and every make-up artists has their own concept of how each deformed psycho should appear, but they should have at least tried to retain some continuity with the previous picture. Like I said, I don't know why exactly this movie doesn't work as well as the first 2. Perhaps it is because we have seen it all by the time the third film comes along and we are no longer shocked by these brutal murders. Perhaps it is because the characters aren't engaging and we don't care what happens to them. Perhaps, as Freddy would do a few years later, Jason was becoming too familiar to the audience. We had a good idea of who he was and what he would do. I know people will argue that every Friday film is just an excuse to show elaborate murder scenes. This is, in part, true. However, the first 2 movies were able to overcome this and they turned out to be pretty good horror movies. Part 3 seems to be the cliché movie that series detractors claim all the films are. Breaches in continuity like Jason appearance and the fact that these kids are going out into the woods despite the fact that the killer of 9 or 10 people the night before is still at large in the area, are what makes it hard to defend the intelligent aspects of the first 2 movies, as well as a few of the others. It does hove some good points. Most of us come to Friday the 13th looking for a lot of machete mayhem. Part 3 delivers in this area. Although the kills are not, for the most part, as bloody or shocking as they are in the first 2 movies, they are still well planned and mostly effective. Since no 3D prints are available for home use, there isn't much point in discussing that aspect of the movie. The kills aren't bad, but the other scenes that are obviously staged for the benefit of the 3D effect are a bit annoying. The acting isn't too bad. 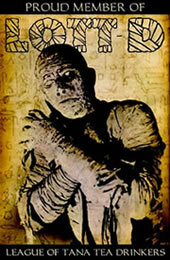 The actors did pretty well with their roles, but they didn't really have a lot to work with. It was, perhaps, with this sequel, that Friday the 13th movies became "Jason movies" and the actor that plays Jason (Richard Brooker) does a nice job. He is frightening and intimidating in the roll. With the loss of his hidden cabin with its altar to his dead mother, Jason has lost a lot of his character and is becoming more of a plot device instead of another character in the story. If you are Friday fan like me, you will probably like it, but you will have to admit that it isn't the movie the first 2 are. I was afraid that I had just become to jaded after years of subsequent horror. So, I have recently been working my way through the series again. The bottom line is this: the first 2 movies are still effective and of a higher quality. This third installment, although still pretty good, just isn't quite on the same level.